The below entry is a discovery, not an explanation. I (intend to) write what I see, and what I expect I have found - I do not pretend to fully understand. Just as the atom can 'weirdly' be described as being both a particle and as a ‘smeared out’ wave at the same time, so too, as I shall demonstrate, can the fractal be described in such a way - only for the fractal it is not so weird. The fractal is defined by a pattern, object or shape repeating or iterating. 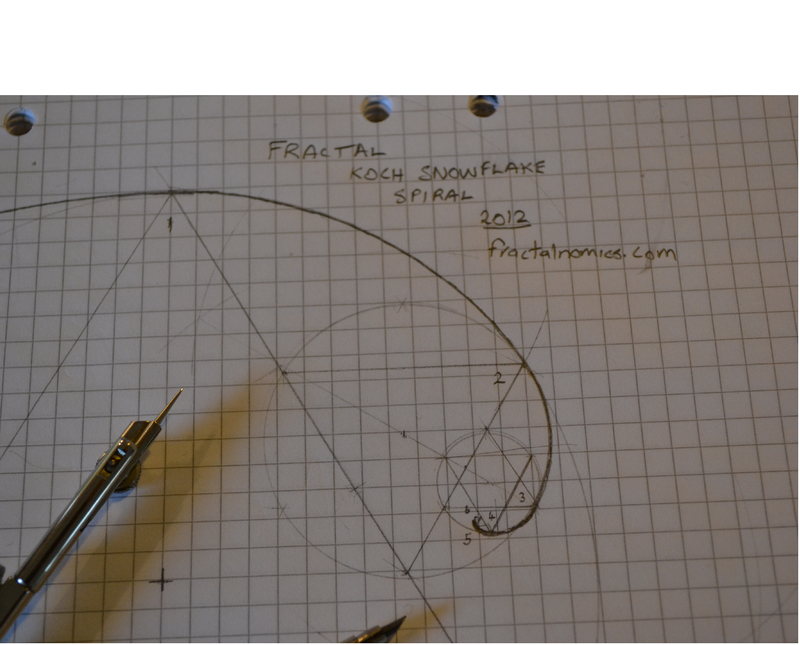 The the Koch Snowflake (below) demonstrates this iterating - the triangle represents the particle. The triangle (in the Koch snowflake) is a real - but discrete - object, when grouped or iterated, the group or repeating collection creates or forms a snowflake - just as the many branches (on a tree) make a tree. There are (in principle) an infinite amount of triangles expanding both into, and out of the point of observation in the fractal (below). On the superposition fractal (above), position and scale of any one triangle – or 'particle' – cannot be determined without a reference, observation or measurement. When this observation is made, the superposition fractal (taken from quantum mechanics) 'collapses', the shape is formed, and the fractal position and scale is known. The fractal as a wave. 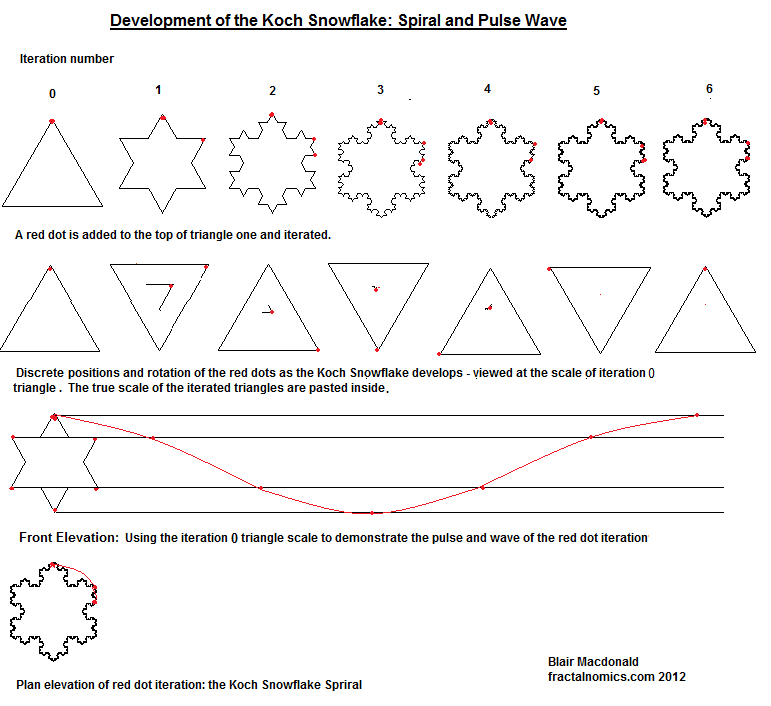 The (Koch Snowflake) fractal (above) is a wave like object. As can be seen that the perimeter of the formed fractal is made-up of an infinity of triangles/'particles' and these together act as or form a wave. When a change is made to one of the triangles (the red dot on iteration 0) and this change iterated, as demonstrated, the wave is revealed. Any change to the triangles/ particles will 'mutate' or change the shape of the fractal and be viewed as a pulse, propagating, cycling round and round every 6 iterations (in the case of the Koch Snowflake), forming, if one were to view a change made to the fractal from a Front Elevation view, a pulse in the form of a classic wave. The wave will range through an infinitely of scales: from infinitely large amplitudes, frequencies, and wavelengths, – down to, but never reaching zero. The wave will move or be produced at fractal production speed. There are issues of spin direction too. The spiral can spin in both directions, clockwise and or anti-clockwise. 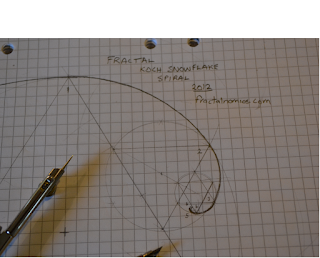 I am aware that with this discovery, it maybe deduced that the fractal is some kind of force. The fractal wave will increase in frequency, and decrease in amplitude and wavelength – logarithmically – as fractal iterates. The wave is sinusoidal. I can only offer the electromagnetic spectrum as an example of this phenomena. I thus deduce that the electromagnetic spectrum is a fractal phenomena. From a Plan view – the cross section view – the fractal is a standing wave. The attractor is a standing wave. 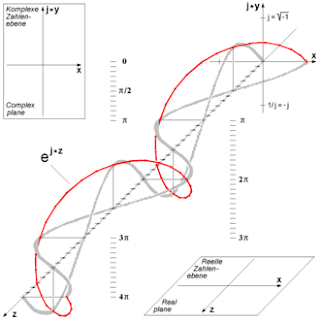 I have often thought of the economy as being a standing wave – activity being the flow. The correct deduction by my intuition (I admit) is not that any wave dynamic is a fractal phenomenon, but that all fractals are wave phenomena. The point is that the universe is internally infinite to all resolutions, and that at any and all resolutions it is not primarily fractal, but sinusoidal.